We're sorry; this book is temporarily unavailable. We've listed similar copies below. Synopsis: For years the public has become increasingly disillusioned and cynical about its governmental institutions. In the face of alarming problems-most notably the $400 billion budget deficit-the government seems deadlocked, reduced to partisan posturing and bickering, with the president and Congress blaming each other for failure. And neither party can be held accountable. The public tendency is to blame individual leaders- or politicians as a class-but an insistent and growing number of experienced statesmen and political scientists believe that much of the difficulty can be traced to the governmental structure itself, designed in the eighteenth century and essentially unchanged since then. Is that inherited constitutional system adequate to meet the challenges of the twenty-first century, or has the time come for fundamental change? Should we adopt an electoral system that encourages unified control of the presidency, the Senate and the House? Lengthen terms of office? Limit congressional terms? Abolish or modify the electoral college? Introduce a mechanism for calling special elections? Permit legislators to hold executive offices? Redistribute the balance of powers within the governmental system? 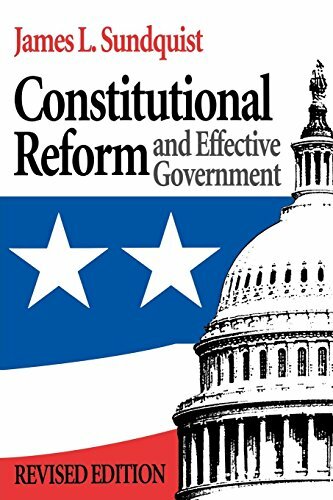 In this revised edition of his highly acclaimed 1986 volume, James Sundquist reviews the origins and rationale of the constitutional structure and the current debate about whether reform is needed, then raises practical questions about what changes might work best if a consensus should emerge that the national government is too prone to stalemate to meet its responsibilities. Analyzing the main proposals advanced to adapt the Constitution to current conditions, he attempts to separate the workable ideas from the unworkable, the effective from the ineffective, the possibly feasible from the wholly infeasible, and finally arrives at a set of recommendations of his own.